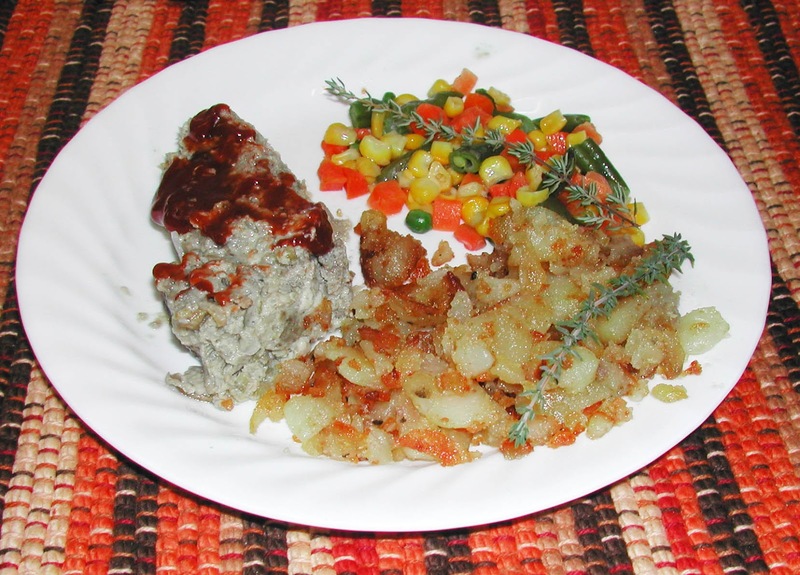 One of our readers who only commented as Anonymous gave a recipe for a meatloaf she makes with cottage cheese and no filler. Since as a Celiac I struggle with making things without filler of some kind I decided to try it. My daughter is moving and has a broken arm so wanted to fix supper for her and her family. We all thought it was excellent. I used onion and celery and some Italian seasoning. Next time I will add some Worcestershire sauce or maybe some soy sauce. What I did find is that without the filler it is more fragile and you need to let it stand for at least 10 minutes before cutting. I am thinking it would work better as meatballs, another option to try. If I am going to make it into meatballs I would bake them so they don't have to be turned as much. I am going to try that as they would also be easy to freeze and would get a crisper crust. Anonymous gave just a simple set of directions and amounts, I will try to list some amounts that I used. Thanks again to whomever posted that comment. If you let me know your name I can give you credit for the lovely recipe. Mix well in a bowl, hands work well for this step. Place in a bread pan and then if you like it you can spread some chili sauce or ketchup on top. Slice and serve from the pan as it is too fragile to turn out. The meatballs would be easier to handle I think. the cottage cheese should have helped to keep it moist. i like cottage cheese so I might have to try this. I'm excited about this recipe! I love meatloaf, like cottage cheese and am trying to cut down on carbs. Thanks to you, Myrna, for trying it and posting your directions and suggestions. Thank you also to the contributor! What a great idea. I am gluten free and it’s been difficult to find the correct way to make a good tasting meatloaf and not have it come out a big dense brick. I'm wondering if maybe a little less cottage cheese would make it firmer? When you use ground beef, what % of fat is yours? Would that make a difference, too? Thanks, Anonymous & Myrna, for sharing this!